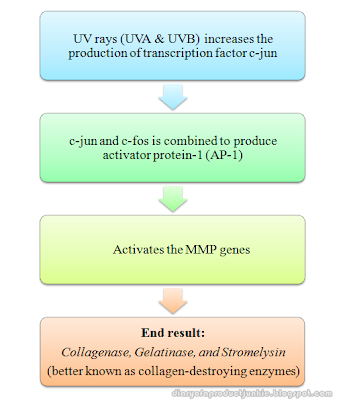 Hello, lovelies~ Today, I'm going to discuss briefly about one of the most important proteins in our body (specifically, our skin) by the name of collagen. By now, the name must have sounded very familiar because it has been all over the cosmeceutical industry nowadays. The promise of plump, bouncy skin by applying these collagen-containing moisturizers, creams, and whatchacallit. Well, is it true? Let's find out. 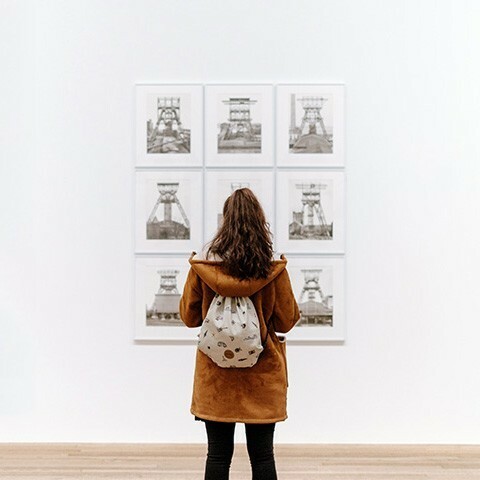 To be exact, there are six types of collagen that is present in the dermis (our deeper part of skin); Type I collagen, Type III collagen, Type IV collagen, Type V collagen, Type VII collagen, and Type XVII collagen. In short, they all work together to keep our skin firm and resilient. It may sound harsh, but that's the easiest way to put it. The sun's rays, both UVA and UVB, causes the increase in the production of enzymes that destroys our collagen supply. That is why it is important to always wear sunscreen everyday. 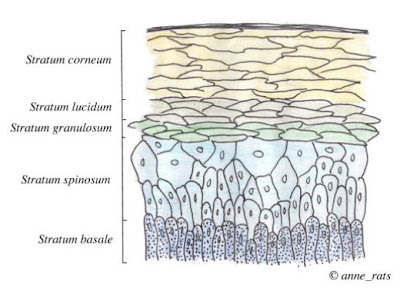 If you want the more detailed pathogenesis of how it can form those enzymes, please refer to the picture above. How Do We Increase or Maintain Collagen Supply, then? The amount of collagen in our skin can be increased in many ways. 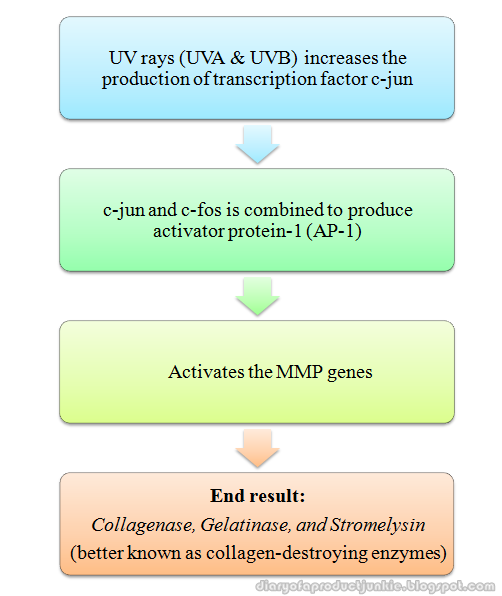 The picture above mentions some of the many steps in increasing our collagen synthesis. 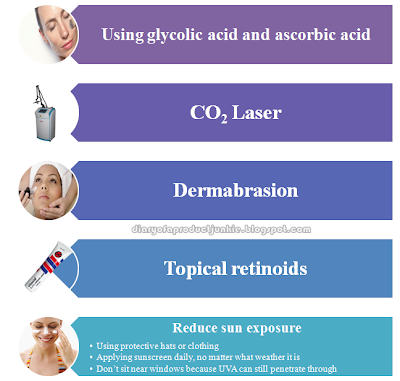 Glycolic acid is usually applied in a chemical peel procedure because it is in a more concentrated solution than those found in moisturizers or creams. Ascorbic acid refers to vitamin C, which will help increase the collagen synthesis in our skin and also act as an antioxidant. Yep, as a basic moisturizer only. 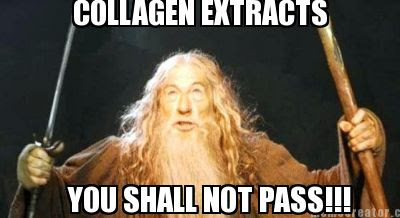 All the claims that they replenish or increase or replace our collagen supply in our skin is false. Well, I can promise you that unicorns will exist someday, but they won't. Aside from unicorns, collagen extracts in creams do exist and they have a molecular weight of 15,000 to 50,000 daltons. 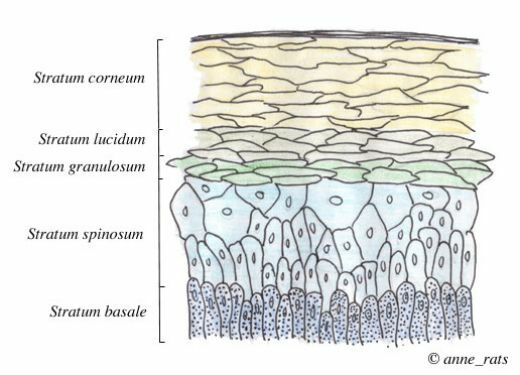 Our outer part of the skin called stratum corneum can only be penetrated by substances with the molecular weight of 5,000 daltons. Hence, the words from our stratum corneum upon encountering the collagen extracts will be somewhat like the picture below. In other words, the collagen extracts found in antiwrinkle creams work best as a moisturizer for those suffering from dry to very dry skin type. It helps to 'conceal' the appearance of wrinkle, but doesn't treat them or make them go away. Beside, they would still have a long way to go to reach the dermis, 5 more layers of obstacles. 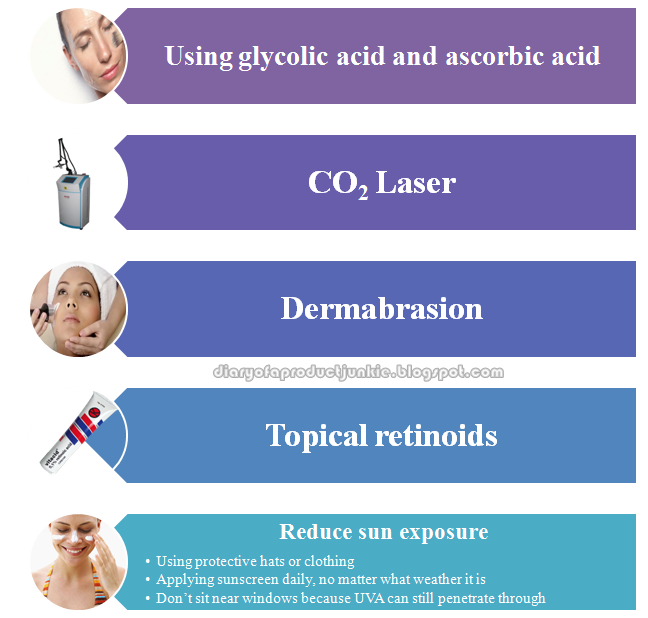 ohya, buat maintain colagen, pake sunprotector ngerti..
tapi yang lain kyk dermabrasi, laser co2, tretinoin dll gmn tuh sai hubungannya..? klo kyk hadalabo yg buat bouncy2 efek, beda ya sama colagen? Xiao, thank you. Hope it's useful. Sev, yang dermabrasi, laser, tretinoin kubahasnya di post kepisah, soalnya takutnya ini jadi kepanjangan. Hada LAbo bouncy efeknya dari Hyaluronic Acid, salah satu protein yang kekuatan ngikat airnya tinggi. Makanya, jadi kenyal2.